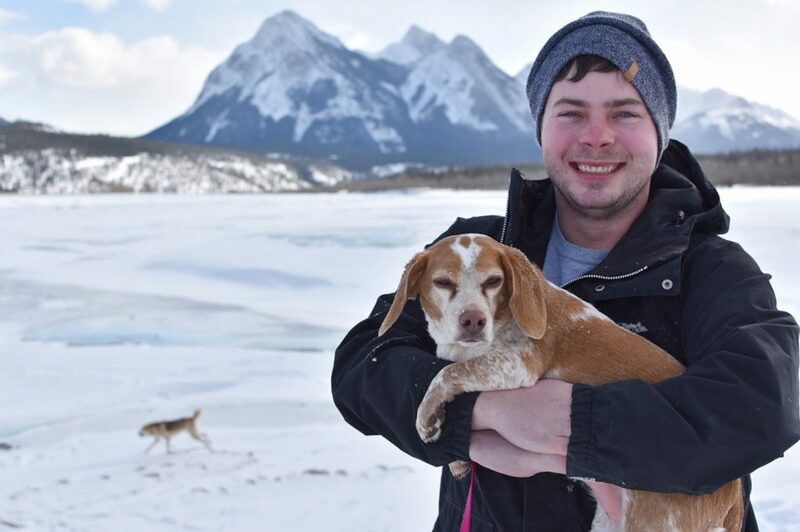 Last weekend Mike and I took Olive, Artie, and our niece from Vietnam to the famed Bubble Lake three hours south west of Edmonton. 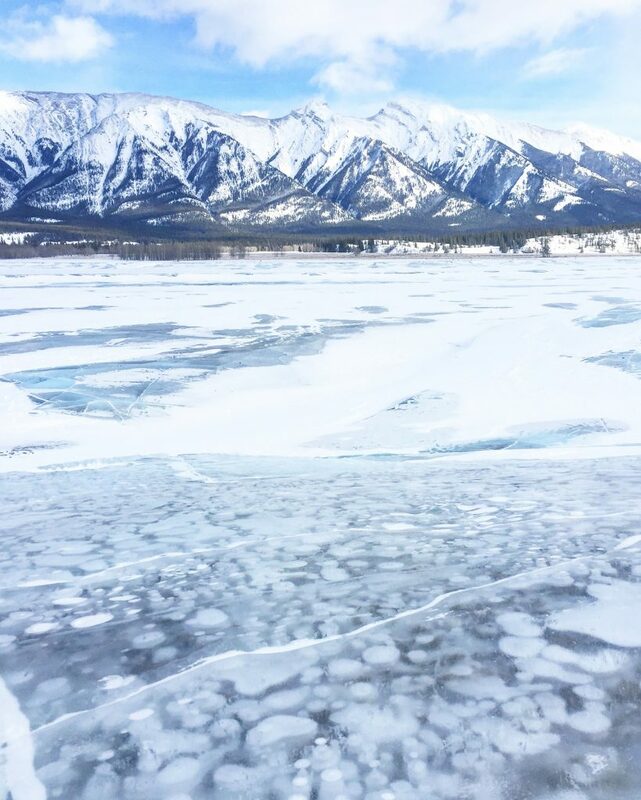 The Bubble Lake (also known as Abraham Lake) became especially popular the last few years as photographers shared photos of the lake’s frozen bubbles online. 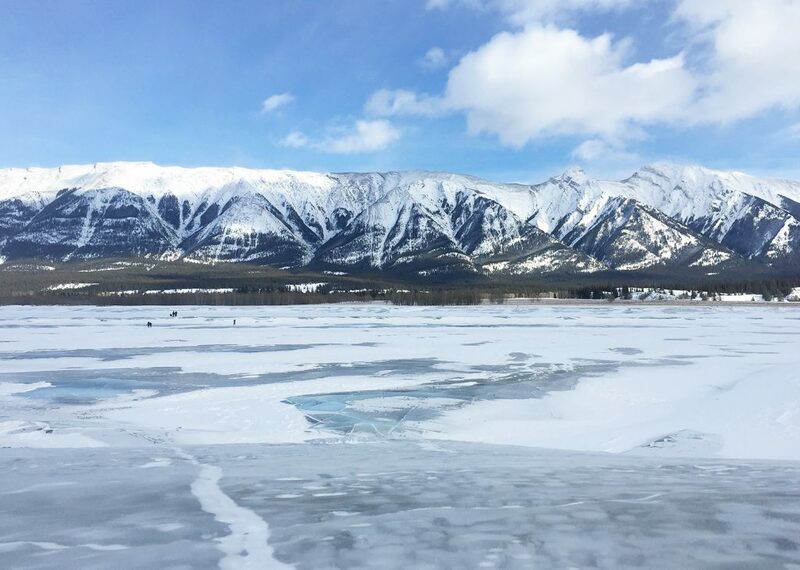 Social media did its thing – and before you knew it, Abraham Lake had received international attention – getting coverage in The Guardian, Smithsonian Magazine, Canadian Geographic, Places to see in your Lifetime, and Buzzfeed to name just a few. 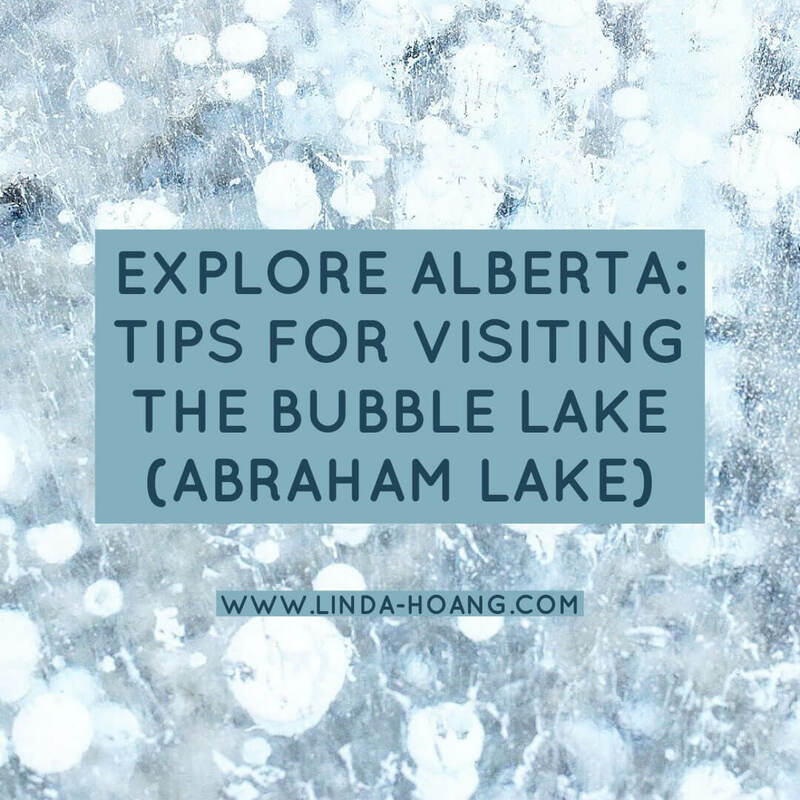 Pin + share my blog post Tips for Visiting Bubble Lake Abraham Lake. So it’s been on my list of places to check out for some time now, and we finally drove the three hours to witness the bubble magic ourselves! 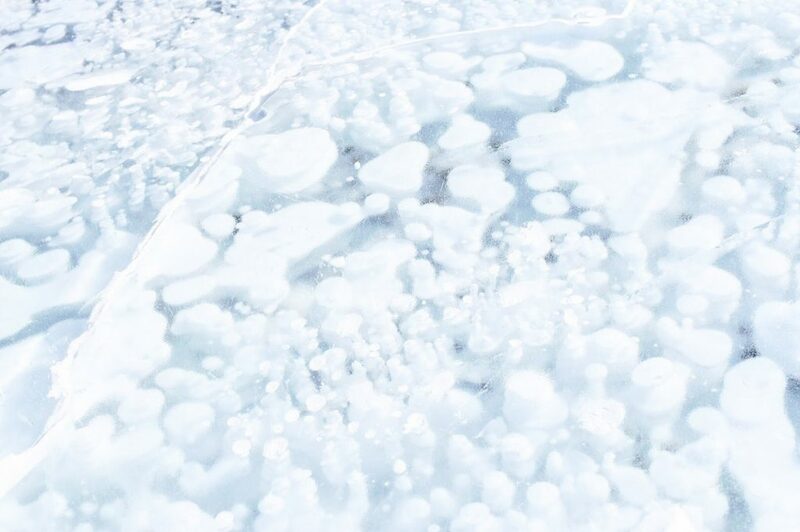 The Bubble Lake is just off the David Thompson Highway past Rocky Mountain House and the hamlet of Nordegg, if you’re travelling west. 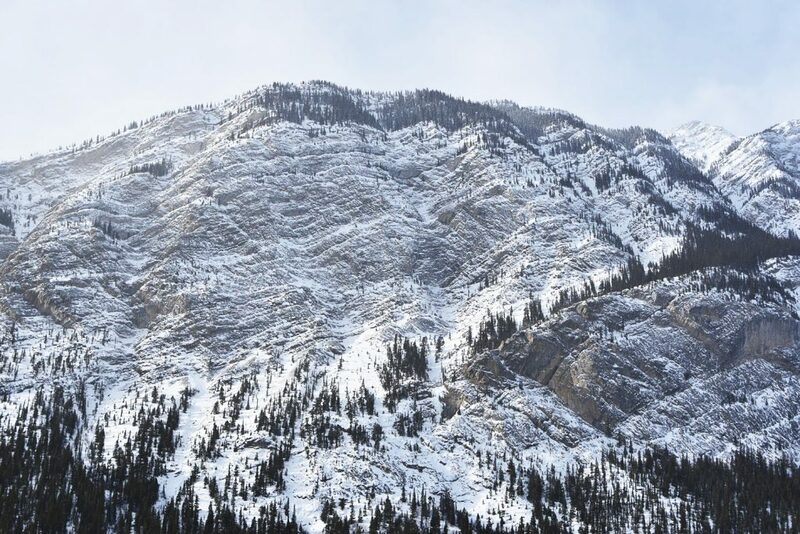 You can also get to the lake from Jasper (travelling down southeast on the Icefields Parkway). 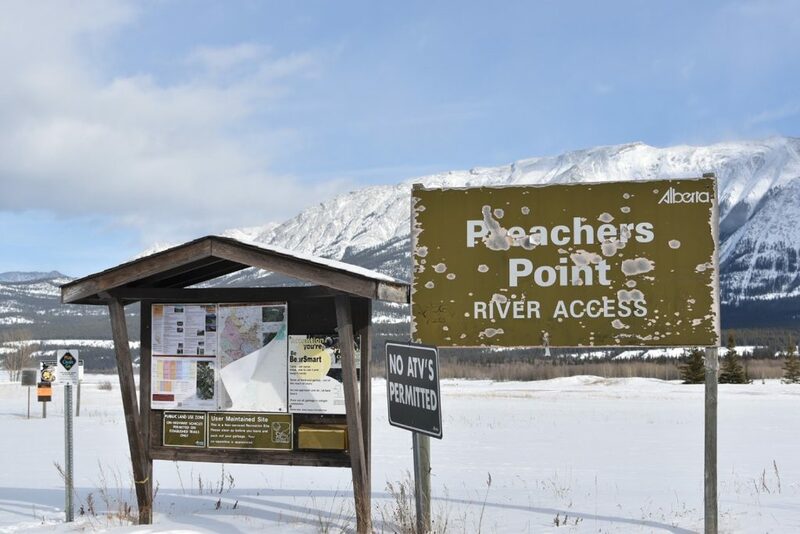 There’s a few places along the highway where you can pull in and actually walk down to the lake, but the most popular and spacious parking spot is called Preacher’s Point (on the very west end of the lake). When we went, there was about six other people parked at Preacher’s Point too! Since there’s really no other amenities nearby, you know everyone here that day had driven quite aways just for the bubble lake experience. And it was a really cool experience. 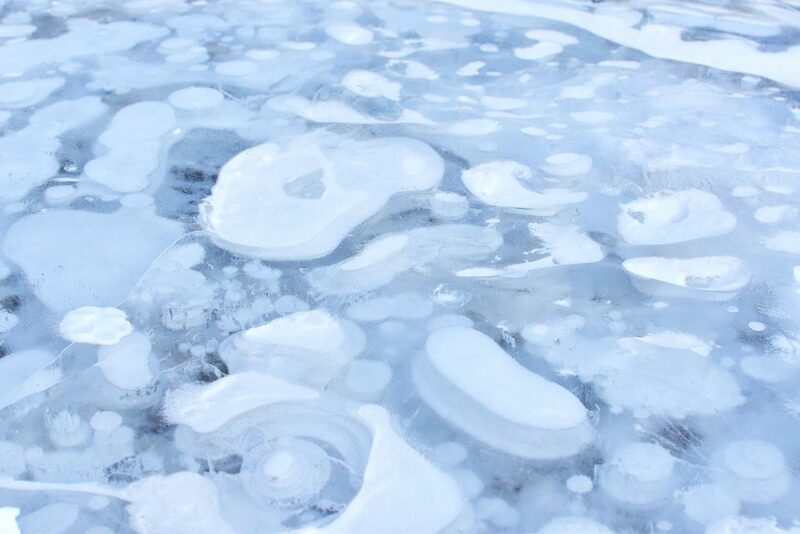 The bubbles are actually methane gas, trapped inside the lake. Apparently it’s highly flammable (but frozen). 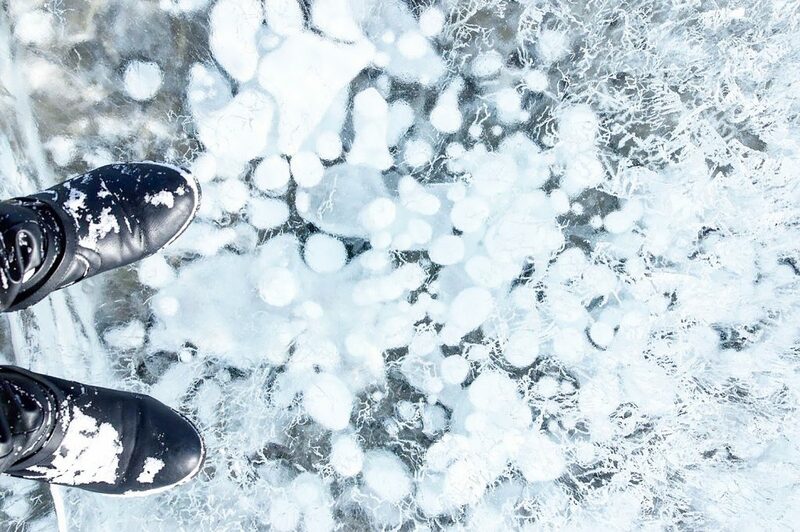 The methane gas bubbles closer to the surface throughout the year before the lake freezes over and traps the gas/bubbles until spring thaw so until then – it makes for a pretty amazing-looking, highly Instagrammable, phenomenon. It’s a pretty unique view and really cool that such a lake is so close to Edmonton. The day we went, there was a lot of recent snow over the lake so there weren’t as much bubble spots as I’d have preferred. I had wanted to skate on the lake but there was so much snow that there wasn’t any clear skating spots. There was enough bubble spots to satisfy my primary goal (viewing and getting photos of the bubbles) but definitely not enough clear strips for a smooth skate. 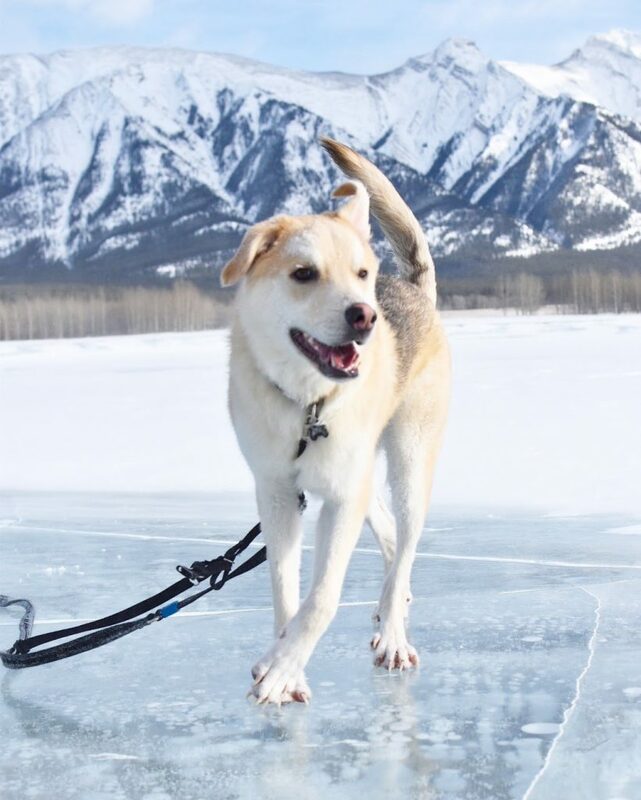 We were grateful for the snow though, because it provided some firm footing as we made our way across the slippery lake! It was a beautiful, sunny, blue sky day (one of the things I love about Alberta weather). 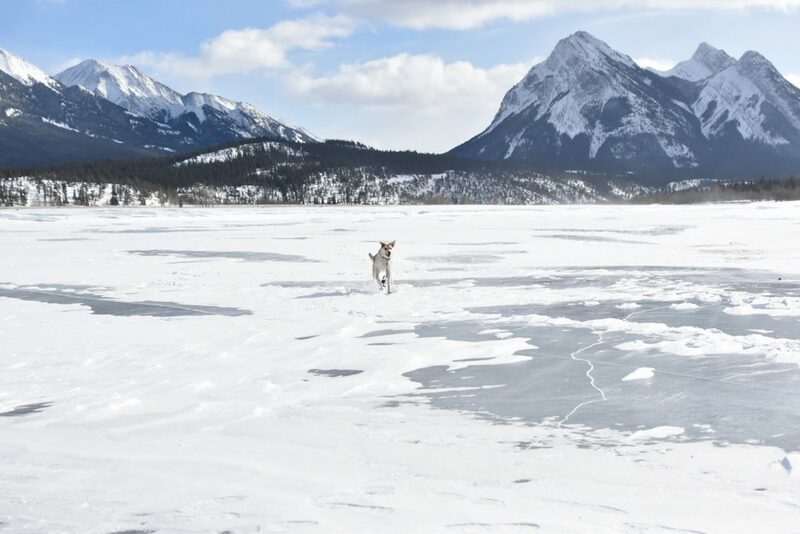 I couldn’t help but feel very small among the towering mountains and vast (really – it’s soooo big) frozen lake. It was truly a spectacular view. 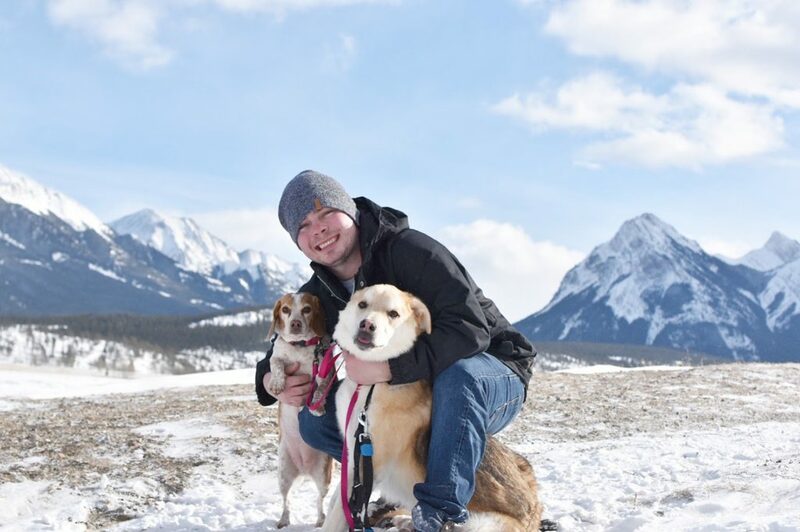 This was Olive and Artie’s first time in the mountains and Artie was having the time of his life running through the snow and sliding on the ice. 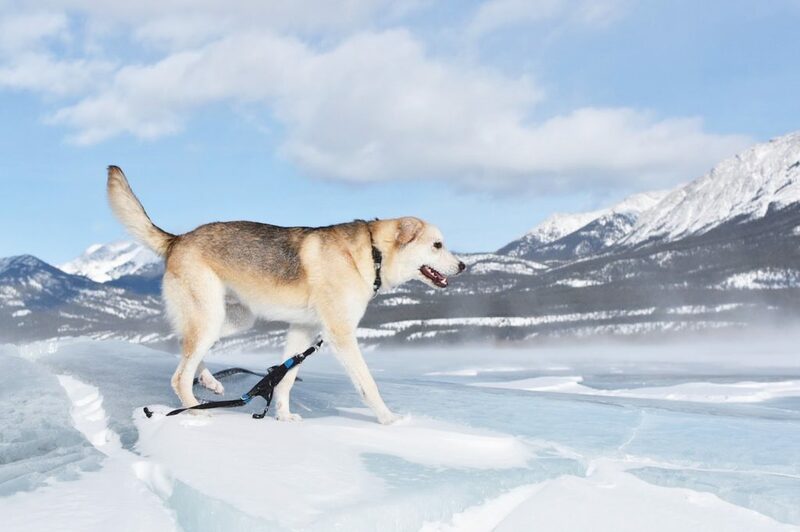 (Olive had less of a grand time, lol definitely not a mountain/snow/ice dog). We all slipped and fell a few times (be careful!) but had a lot of fun. 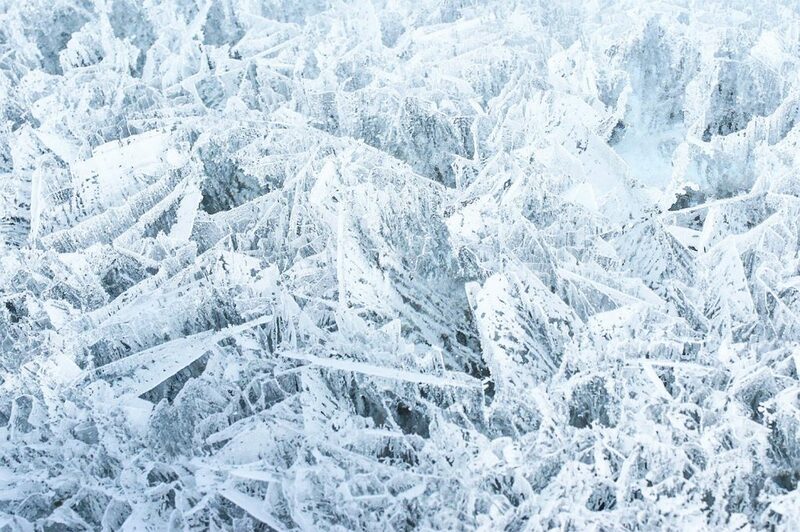 For a six-hour drive (there and back), you should try to make the most of your trip by coming with skates (if there’s not a lot of snow on the lake) or maybe snowshoes (if there is a lot of snow). As I mentioned, my main purpose for the trip was to see it (marvel at it) and take lots of photos – which I did – so I was quite pleased. There’s not a whole lot more to do beyond that, so know that going in to this trip. I think a visit to the Bubble Lake would make a nice weekend trip though if you did have a bit more time. 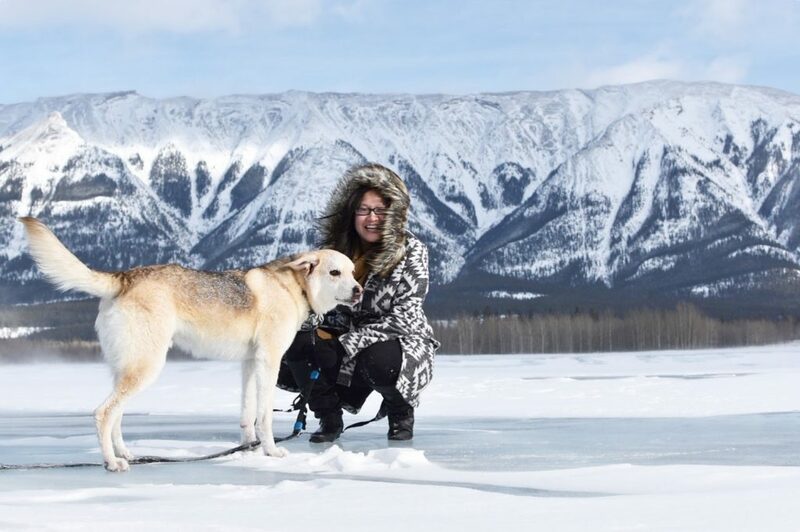 Head to the lake first, then spend the night in Jasper before heading back to Edmonton the next day, but it’s definitely doable (and fun) as a day trip. You can also check out some more beautiful photos of the lake on the Instagram feed here. 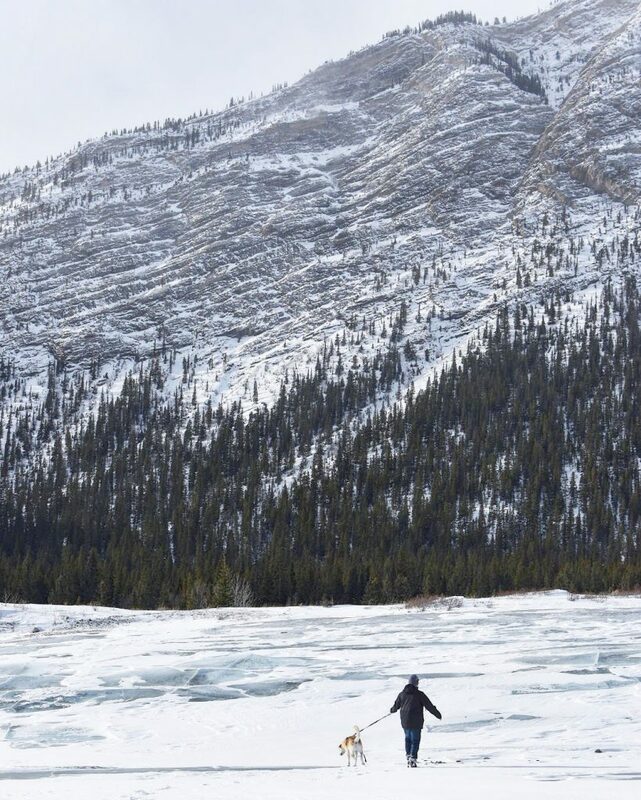 So have you been to Abraham Lake? What did you think?! Tweet me or leave me a comment below. Those are great photos, Linda. Thanks for sharing.